The true charm of the Shimanami Kaido lies hidden in the artistic scenery weaving among the many islands and bridges. People can connect with others and with nature while enjoying the Shimanami daily life where time passes gently by. We suggest you take part in the bicycle trip, "Cyclo Tourisme Shimanami," that allows you to jump into the day-to-day life of Shimanami citizens and learn while enjoying the tour. Our concept is "Island Time Pottering." On our guided tour, you can comfortably enjoy the secluded private spots and the charming back alleys of the islands. We welcome beginners to participate with us. Let's go for a Shimanami Kaido treasure hunt together! 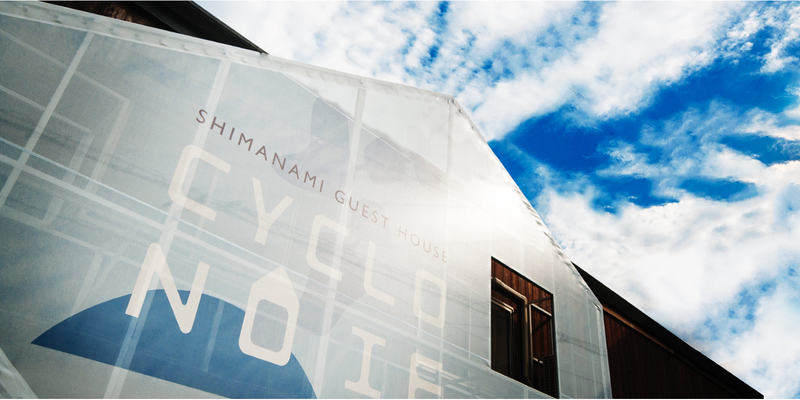 What is Cyclo Tourisme Shimanami? 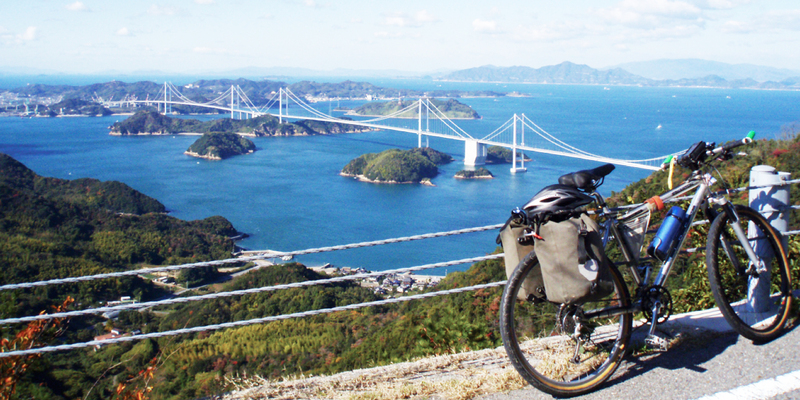 The Shimanami Kaido, the cycling road linking the islands of the Seto Inland mous for its scenic beauty. "Cyclo Tourisme Shimanami" is a private nonprofit organization with a goal of sustained community improvement through the spread of "Cyclo Tourisme," a style of trip in which you can enjoy the Shimanami Kaido with all five senses. We develop activities in the main fields of Imabari, Ehime and on parts of the Kamijima that encourage people to celebrate "scenery art" by bicycle and to celebrate the local lifestyles present there. We encourage a new sense of values that protect local nature, histories and traditions and promote sustainable local living. Our cycling guide staff members, who are Shimanami Kaido experts, manage ial cycling tour event. We welcome requests from participants at any time. Our aim is to improve the environment and services of the Shimanami Kaido cycling route. Specifically, we manage the newly established "cycle oasis" rest areas, coordinate trouble response services, and we have proposed a new "cycle train" service. 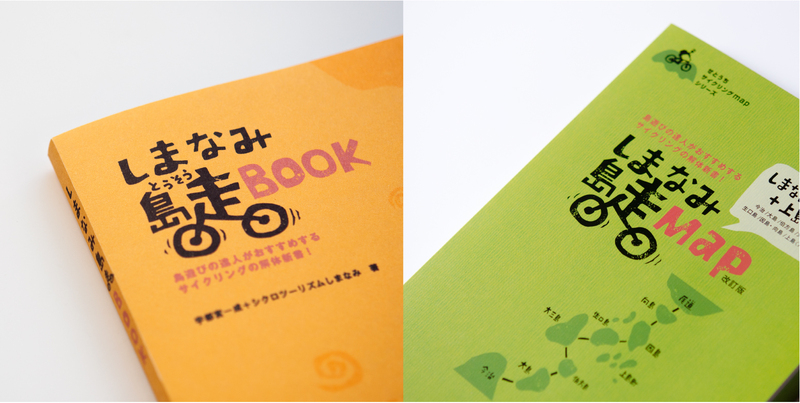 We manage "CYCLONOIE" and "Cyclo Café" where cyclists from around the world can gather and exchange information. We recommend that you take part in our mini tour so we can meet every cyclist's individual needs. On this short tour, everyone, regardless of their ability or physical strength levels, can experience the charm of Shimanami Kaido's secrets. Cyclo Tourisme Shimanami can coordinate a bicycle trip that will bring happiness to your mind and body. We cover information about bicycles as well as information about all of the islands so that you can enjoy slow cycling (pottering) without much physical difficulty. However, accidents or injuries may still occur. We strongly recommend wearing a helmet to prevent risks while cycling. We also ensure that bicycles are well maintained before you depart for a cycling trip to prevent flat tires or other minor problems. If you have any trouble, we have a system in place to provide support to you on site. Our motto is to communicate with a smile as well as to provide safety and comfort for customers. 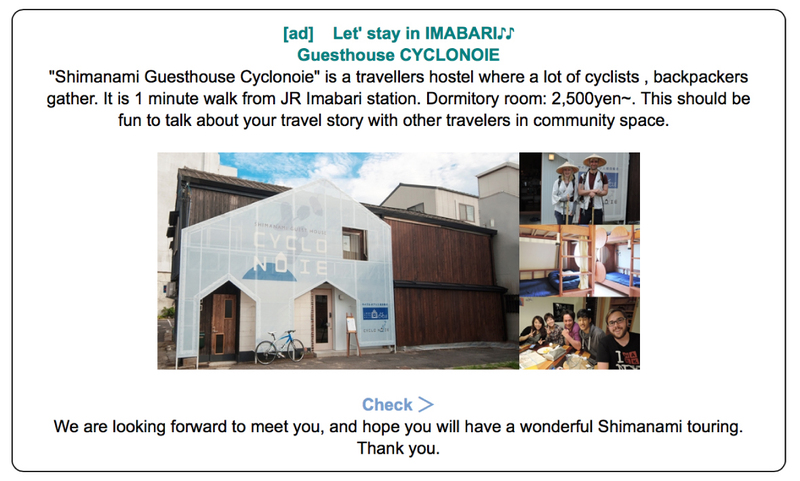 The guesthouse 'CYCLONOIE" is located in front of JR Imabari Station. We have dormitory rooms, private rooms, community spaces, shower rooms, and bicycle parking. Since 2014, we have been a center for travelers from all over the world who come to Imabari to enjoy cycling. We publish maps and guidebooks which are useful for cycling the Shimanami Kaido (at present, only Japanese is available). The information in these materials has been compiled by local guides who have cycled and collected data all over the islands. Our cycling tour plans are created based on this information and our connections with local islanders. We give advice to companies, public administrations and others about promoting regional cycling activities. A reservation is required. 1. Details about scheduling We would appreciate the details of your schedule when you make a reservation with us. When you make a reservation, please let us know what you want to discuss with us. In some cases, we will ask you to send documents regarding the subject before meeting. ※ Consultation meetings are scheduled for approximately one hour. 3. Guided Tour Anybody who would like to have the experience of a guided tour on the Shimanami Kaido, please feel free to get in touch with us. Please click here for more details about the guided tour and charges.